I am a South Indian. Anybody who knows South Indians knows that we love our rice. A lot. Which means a lot of leftover rice – which is also consumed, because we love rice, remember? 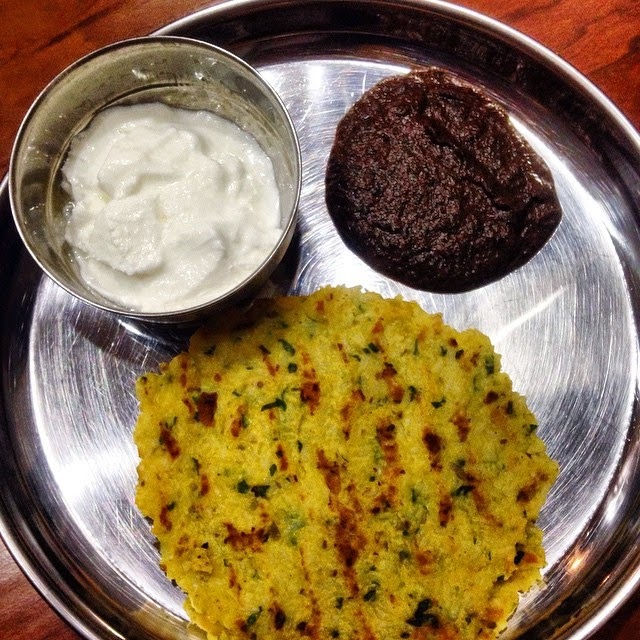 So here’s one of my favourite ways to make use of leftover rice – make it into a thepla or flatbread. Mix all the above ingredients by hand. Add water only if required. You don’t want a loose dough. Spread a damp cheesecloth on the kitchen counter. Dip your hand in water and pat out a blob of dough into a flatbread as thin as you can. Transfer the flatbread with the cheesecloth on to a nonstick pan and as soon as you do that, peel off the cheesecloth. Cook the flatbread till it is browned and cooked through. Serve hot with some homemade yogurt ( Click Here for my yogurt recipe). My picture also shows red chard saag (which unfortunately doesn’t photograph very well, but it is delicious). But that’s a recipe for another day. Enjoy!